Hot on the trail of the upcoming Kamen Rider 1 The Movie, Toei's Super Hero year Project has finally unveiled the next showa Kamen Rider to be given a new look and a new multi part net movie! 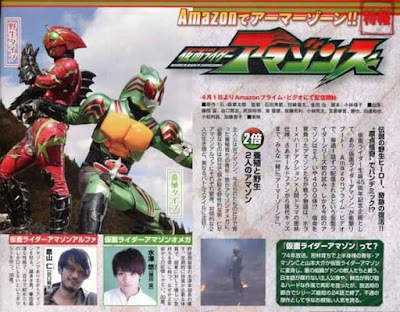 Entitled Kamen Rider Amazons, it will feature 2, yes you read it right, 2 versions of the monster ripping showa rider which are called Kamen Rider Amazon Alpha (which was designed after the SIC hero saga exclusive) and Kamen Rider Amazon Omega (a new look for the original). The movie will star Tomi Fujita as Yu Misuzawa/Kamen Rider Amazon Omega and Kenji Taniguchi as Jin Takayama/Kamen Rider Amazon Alpha (also known for his role as Tatsumi Nagare/Go Blue of Kyukyu Sentai Gogo V). Kamen Rider Amazons is written by Yasuko Kobayashi and directed by Hidenori Ishida, Ryuta Tasaki, and Osamu Kaneda and will premiere this April 1 and will be available only via Japan's Amazon Prime. "Masked Rider Amazons (all 13 episodes) arrive April 1 on Amazon Prime video!" No more friendship handshake lol. This is the Amazons that we want!! I never watched Amazon (though I believe my father did, if I'm not mistaken. ), but these designs are amazing. I think it's interesting how Amazon Alpha has the same suit shape as the original Amazon, but done in red with different markings. The Amazon Omega suit is just awesome. Plus the main theme for Amazons is named "Armour Zone", a pun word for Amazon. Wasn't that well played?